Chloe Grace Moretz's Wednesday Addams is the focus of The Addams Family animated movie teaser. The actress shared the short tease on social media while also announcing that the full trailer drops tomorrow. Many would have assumed Wednesday would announce a release date on a Wednesday, but Tuesday is just fine for fans who have been waiting quite a while to see what this new take on the classic franchise will be like. So far, the poster looks great and Moretz's animated Wednesday seems spooky enough. Conrad Vernon and Greg Tiernan's animated The Addams Family hits theaters in time for the Halloween season, but we're getting our first taste a lot sooner. Chloe Moretz shared a quick teaser of her Wednesday Addams pulling a string and revealing the trailer announcement. The trailer will officially drop tomorrow, April 9th. The movie centers on the family as they face-off against a "treacherous, greedy crafty reality-TV host while also preparing for their extended family to arrive for a major celebration." In addition to Chloe Grace Moretz as Wednesday, The Addams Family animated movie also stars Oscar Isaac as Gomez, Charlize Theron as Morticia, Finn Wolfhard as Pugsley, Nick Kroll as Uncle Fester, and Bette Midler as Grandmama. The movie introduces Alison Janney as reality-TV host Margaux Needler and Elsie Fisher as her daughter Parker. Other than that, everything is pretty much under wraps about the project. 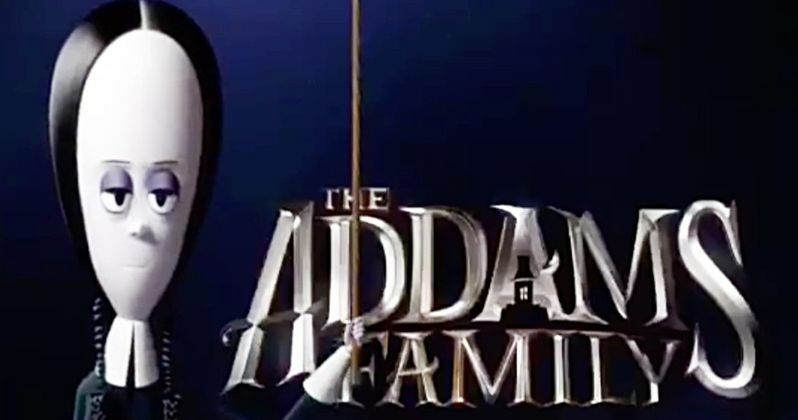 With that being said, fans have been waiting since 2017 for this particular project, though another Addams Family animated movie was talked about in 2013 with Tim Burton attached. Conrad Vernon and Greg Tiernan are excited about their Addams Family animated movie. The two admit to being fans of the previous versions including the movies from the early 1990s and the original TV sitcom from the 1960s. However, when it came time to make their version of the spooky family, they decided to take it in a different direction. Vernon had this to say. "Greg and I have always been a fan of The Addams Family in past versions, so when we set out to make this movie, we were excited to do something new. With that in mind, I drew from the brilliantly original Charles Addams New Yorker cartoons for the look of the film and decided to tell the story of how Gomez and Morticia meet, find their house and start their family. This unique approach is what drew me in to direct the film. The reimagining also extends to the stellar cast we've put together who will each bring their own spin to our film that will appeal to longtime fans of the Addams and introduce them to a new generation." The Addams Family animated movie hits theaters on October 11th, giving fans plenty of time to see the movie before Halloween arrives. The movie was originally going to come out on October 18th, but it shifted dates to avoid competition with Disney's Maleficent: Mistress of Evil. While we wait for the trailer to drop tomorrow, you can check out the short teaser below, thanks to Chloe Grace Moretz's Twitter account.